Everyone now and then when the planets are aligned just right, Tom Angleberger's brain goes into hyperdrive and conjures up a hilarious, whacky adventurous story about dodos. Okay, okay, they aren't all about dodos. But this one is. 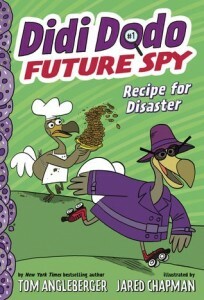 Didi Dodo, future spy, just rolled into Koko Dodo's Cookie Shop looking for action. Unfortunately, Didi Dodo was rolling a little bit too fast and she landed in the snickerdoodle cookie dough knocking over a bowl of fresh chocolate chips on her way. She's arrived with a plan. Koko Dodo's Super Secret Fudge Sauce recipe has been stolen and that means Koko can't make the cookies topped with the Secret Fudge Sauce to win the Queen's Royal Cookie Contest. Never fear. Didi has a plan. So, a couple of dodos head out to see if they can get the recipe back or at least find the secret ingredient and win the contest. Do you think anything will go wrong? Do you think Koko will try to ice skate out of the cookie shop? Do you think Countess Zuzu Poodle-oo's butler will help them? No plan is too daring for a couple of dodos.